I've discovered that I can't get my hands on a semi decent bagel here in the 'Knife. Yeah, you can get the pre-packaged grocery store ones... but those are almost always just about stale when you see them on the shelves. Every once in a while they'll carry bagels that were baked in house but they're still not all that great. Make sure your yeast is active. Stir the sugar, yeast and warm water together until everything's dissolved, then walk away for five minutes. If little 'blobs of foamy stuff' have started to form on the surface, proceed. Stir the yeast mixture, oil, one egg, 1 tbsp maple syrup, salt and 3 cups of flour together until a shaggy, soft dough forms. Slowly knead the dough while incorporating more flour. Keep doing this until your dough ball becomes smooth and firm, about 10 minutes. If you've never done it before and you're not sure if your dough is smooth, keep kneading. You'll know when it's ready. Cover your dough ball with an upturned bowl and walk away for 15 minutes. Cut your dough ball into 12 equal (ish) portions and roll them into snakes that are 8-10 inches long. If they keep shrinking on you, let your dough relax a little longer. I find that if I roll them all out, by the time I go back to the first one it's relaxed enough not to spring back when I roll it out a second time. Wrap each dough snake around the back of your hand and pinch the two ends together. You'll have a very sad looking O with a huge hole- that's a good thing. Put the rings on a flour dusted counter and cover with a clean dishcloth that's slightly damp. The easiest way to get your cloth evenly damp... wash your hands and dry them with it. Let your dough rest for 30 minutes. Bring your pot of water to a boil, add the rest of the maple syrup. Preheat your oven to 425°F. 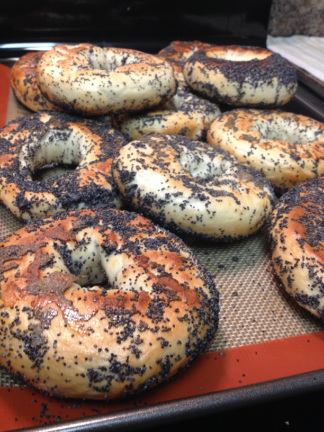 Place each bagel into the water one at a time and boil on each side for about 45 seconds. Remove from the water and let them dry off on paper towels or a clean dish towel. I use the chopsticks for this step- keeps you from squishing the dough in the water. Beat the second egg in the first small bowl and place your seeds in the second. Line your baking sheets with silicone or parchment- do not grease your pans or use foil. Dip each bagel first into the egg and then into the seeds, making sure that they're coated on both sides (lots will fall off during and after baking so be generous) and place them about 2 inches apart on the baking sheets. Bake for 8-12 minutes on the first side (until there are brown edges showing), flip each bagel and bake for an additional 6-8 minutes, until fully golden.